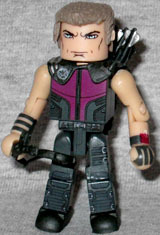 While he has no super powers, Clint Barton is an expert marksman, and was on the scene when S.H.I.E.L.D. first encountered the Asgardian known as Thor. As a member of the Avenger Initiative, his tranquilizer-tipped arrows are the team's secret weapon against a rampaging Hulk. They are? Was that in an early draft of the script, or is Art Asylum just pulling things out of their butts for this bio text? Hawkeye's costume details are all painted on, except for the pads over his shoulders - and those are only sculpted because it made it easier to attach his quiver. His functional quiver! He comes with three arrows, and they can all be stored on his back. Nice! There's a clip on his bow so you can plug one in there if you want, as well. The likeness isn't very "Jeremy Renner-ish," but you have your choice of heads: bare, or with sunglasses. An undercover agent of S.H.I.E.L.D., Natasha Romanoff was elevated to non-covert status when she was made a part of the Avenger Initiative. Skilled in all forms of hand-to-hand combat and equipped with several high-tech weapons, she can more than hold her own against any foe. "Several high-tech weapons." A.k.a., "two small, mundane pistols." At least Hawkeye can reuse his arrows if he can retrieve them. Widow is wearing her all-black costume, though it's really more all-dark-grey with black details painted on. Amusingly, my figure only has one correct leg: if you look at the picture, you see how the details don't match up? Her right leg is actually from Loki; it must have fallen into the wrong bin at the factory. Her hair is a new piece, and so are her bracelets. There's not much of a likeness here either, but she looks more intense than the last version. 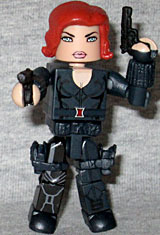 This entry was posted in Art Asylum, Marvel, MMMR and tagged Avengers, Black Widow, Minimates. Bookmark the permalink.